Tonal range: One octave 13 tone chromatic scale from C3 to C4 (piano equivalent). Each of the thirteen reeds are individually tuned and voiced. M2 Dimensions: 38 x 25 x 6.5 cm. Weight: 3.5kg. It has all the same features as the classic M1 and also features:. New strengthened spring system for optimum sustain. Re-designed and re-positioned bellows clip scratch plate for optimum wooden back-board bracing. 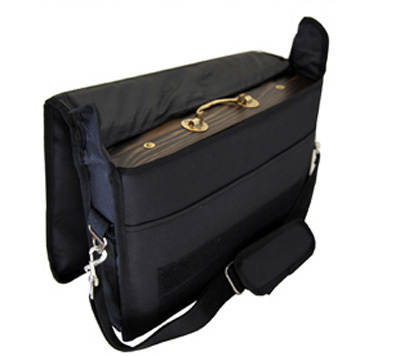 New strengthened lap top style carry case. 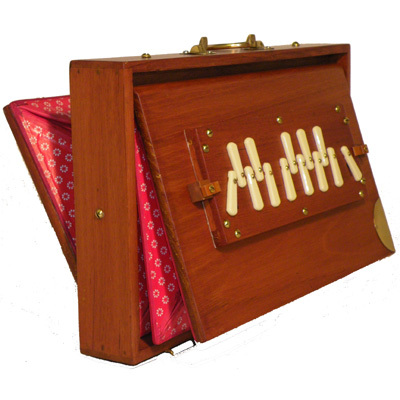 The M2 Shruti Box, sets a new standard in sound quality, ease of playing and construction. It provides an ideal accompaniment for the voice and musical exploration and can be enjoyed by anyone without training. Hand made from solid wood: the body is natural Tunwood; the reedboard is teak; the high grade metal reeds are from India's leading manufacturer. Sound: Features brass light-gauge reeds for a responsive, bright and full tone with characteristic subtle harmonics (often described by players as a 'warm' and 'pleasing' sound). It has a great detailed sound. The M2 C is higher in pitch than the Low G.
M2 Dimensions: 38 x 25 x 6.5 cm. Weight: 3.5kg. Comes with a padded black vinyl carry case.